Ethnomathematics as a program studies the cultural aspects of mathematics. It acknowledges that there are different ways of doing mathematics by considering the appropriation of academic mathematical knowledge developed by different sectors of the society as well as by considering different modes in which different cultures negotiate their mathematical practices. Ethnomathematics researchers investigate ways in which different cultural groups comprehend, articulate, and apply ideas, procedures, and techniques identified as mathematical practices. Ethnomathematics as a program studies the cultural aspects of mathematics. It acknowledges that there are different ways of doing mathematics by considering the appropriation of academic mathematical knowledge developed by different sectors of the society as well as by considering different modes in which different cultures negotiate their mathematical practices (D’Ambrosio 2001). Ethnomathematics researchers investigate ways in which different cultural groups comprehend, articulate, and apply ideas, procedures, and techniques identified as mathematical practices. These mathematical practices refer to forms of mathematics that vary as they are embedded in cultural activities. In this regard, “ethnomathematics can be characterized as a tool to act in the world” (Orey 2000, p. 250) since it provides insights into the social role of academic mathematics. It presents the mathematical concepts of the school curriculum in a way in which these concepts are related to the cultural backgrounds of students (D’Ambrosio 2001), thereby enhancing their ability to make meaningful connections and deepening their understanding of mathematics. In this context, there is a need to examine the embeddedness of mathematics in culture, drawing from a body of literature that takes the students’ cultural base of knowledge production into the mathematics curriculum (D’Ambrosio 1999). The field of ethnomathematics studies students’ diverse ways of knowing and learning as well as culturally embedded knowledge in the pedagogical action of this program. Ethnomathematics explores the interaction of academic and cultural ways to provide inclusive developmental programs for diverse populations served by educational institutions. This program includes curricular relevance and builds curricula around the local interests and culture of the learners (Rosa and Orey 2015). The main foundation of an ethnomathematics program is an awareness of the many ways of knowing and doing mathematics that relates to the values, ideas, notions, procedures, and practices in a diversity of contextualized environments. In this regard, we have come to recognize the need to consider the appropriation of academic mathematical knowledge in different societal contexts as well as ways in which members of distinct cultural groups negotiate their own mathematical practices (D’Ambrosio 2001). Teaching mathematics through cultural relevance and personal experiences helps students to know more about reality, culture, society, environmental issues, and themselves by providing them with mathematics content and approaches that enable them to master academic mathematics successfully. An ethnomathematics approach to the curriculum is considered a pedagogical vehicle for achieving such a goal (Rosa and Orey 2007). Ethnomathematics represents the way that various cultural groups mathematize their own reality because it examines how both mathematical ideas and mathematical practices are processed and used in daily activities. It is described as the art and techniques developed by students from diverse cultural and linguistic backgrounds used to explain, understand, and manage social, cultural, environmental, political, and economic environments (D’Ambrosio 2007). 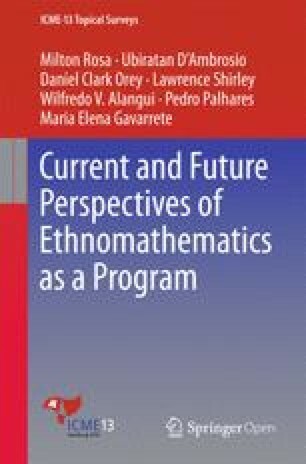 It provides us with a research paradigm that is much wider than the traditional concepts of mathematics, ethnicity, and multiculturalism, where ethno is related to distinct groups identified by cultural traditions, codes, symbols, myths, and specific ways of reasoning and inferring. This program seeks to study how all learners understand, comprehend, articulate, process, and ultimately use mathematical ideas, concepts, procedures, and practices to solve problems related to their daily activities. This holistic context helps students to reflect, understand, and comprehend extant relations among all of the components of the system. Ethnomathematics is at the heart of instructional methodologies. Therefore, it is necessary to prepare students to work in a diverse, multicultural world, with recognition of the contributions the members of other cultural groups have made to mathematics (Shirley 2001) and with an appreciation and openness to new and alternative perspectives, paradigms, and worldviews. In this regard, detailed studies of the mathematical ideas and practices of distinct cultural groups most certainly allow us to further our understanding of the internal logic and mathematical ideas of diverse group of students. This program is aware of diverse ways of knowing and doing mathematics: the ideas, notions, procedures, and practices contextualized in distinct environments. In this regard, we have come to recognize the need to consider the appropriation of academic mathematical knowledge in different societal sectors as well as ways in which members of distinct cultural groups negotiate their own mathematical practices (D’Ambrosio 2001). In this context, the main objective of this ICME-13: Topical Survey of TSG35: Role of Ethnomathematics in Mathematics Education is to show that ethnomathematics provides mathematics education with an important framework that can help transform mathematics into a discipline that is better able to contribute to the attainment of the dream of an equitable and humane society. In this regard, “mathematics is powerful enough to help us build a civilization with dignity for all, in which iniquity, arrogance, violence, and bigotry have no place, and in which threatening life, in any form, is rejected” (D’Ambrosio 2004, p. IX). Similarly, it is important to understand that diverse sociocultural representations and concepts of ethno develop from distinct ideas, procedures, practices, and dimensions of space and time through the relationship between group members in different cultural environments. This can be done by conducting research on how investigations based on ethnomathematics contribute to a different perspective of the very nature of mathematics, which includes valuing and examining the relationship among different mathematical systems.